The Roma Conservatory Awning is designed to mount above glass roofs and pergolas but can also be fitted with posts to create a retractable pergola. 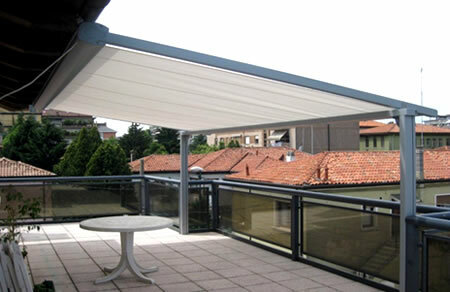 Designed for commercial and residential projects, the Roma Retractable Pergola Awning provides optimum protection from the sun. 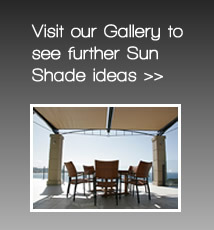 Engineered and built to last, the Roma Retractable Pergola Awning is Italian designed, and fabricated in Australia. The Roma Awning is has been engineered to withstand wind speeds up to 49km/hr. A simple button press will retract or extend the Roma Awning with ease or smaller awnings can be manually operated. The awning system runs on guides and retracts into the cassette 193 x 162 mm, it can operate either horizontally or vertically installed, as well as upside down. Powder coated aluminium profiles, stainless steel brackets ensure low maintenance. Optional intermediate rollers combined with a gradient of 1 in 4 ensure any rainfall flows away, if the awning remains extended during light shower or moderate rain. 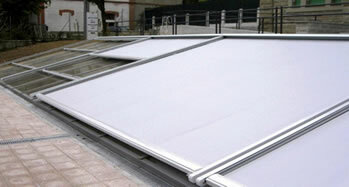 The harsh environment over a glass roof is extremely demanding. This highly versatile and robust awning runs in sturdy 6061 extruded aluminium guide tracks designed for maximum durability. All of the aluminium extrusions are powdercoated and all of the nuts and bolts are marine grade 316 stainless steel. The side guides are all that are required to be attached to the structure of the building. The cassette is attached onto the side guides, so does not require to be attached to the building. Alternatively the cassette can be mounted to the building and the side guides can be supported by posts. The compact and elegant cocoon style cassette ensures that the fabric, motor and running gear are completely protected from the elements when retracted. At the core of every Roma is the rotary pull-out system. The front bar houses two heavy duty spring units which are increasingly loaded as the front bar extends. The more that the fabric is unrolled, the greater the tension becomes. This tension system means that the Roma conservatory awning is not dependent on the easily worn out gas shocks that other conservatory awnings rely upon. For projections over 3m it is recommended to have an intermediate support roller for the fabric. 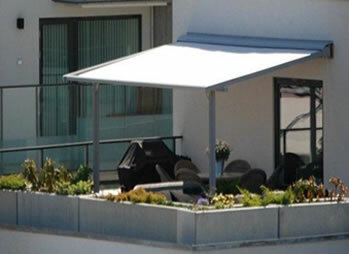 The Roma Conservatory Awning System is ISO 9001 safety tested by German TUV (Product Safety Certification). The Roma awning offers refreshing shade at the touch of a button.